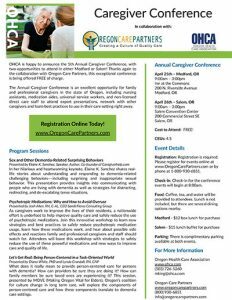 Family and professional caregivers – OHCA is happy to announce the 5th Annual Caregiver Conference, with two opportunities to attend in either Medford or Salem! This exceptional conference is an excellent opportunity for family and professional caregivers in the state of Oregon, including nursing assistants, medication aides, universal service workers, and non-licensed direct care staff to attend expert presentations, network with other caregivers and learn best practices to use in their care setting right away. Thanks again to the collaboration with Oregon Care Partners, this exceptional conference is being offered FREE of charge. Registration is required – go to www.OregonCarePartners.com to reserve your seat today!